It took me a while to get into this book, mostly because of the style of writing and the language used. However, once I had got used to the lack of speech marks and the odd way the protagonist narrates the story, I found the book hard to put down. The memoirs of the notorious Moll Flanders look back on her colourful life. 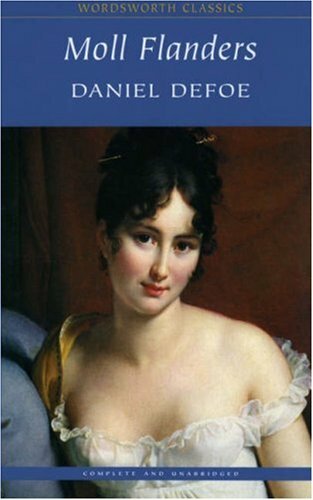 The full title is The History and Misfortunes of The Famous Moll Flanders, which I think is a much more interesting title and very accurate. Moll is an fascinating character who I can’t help feeling sorry for. She is not a bad person, just unlucky. Her childhood is a hard one, but not unhappy. Being born in the London prison of Newgate to a criminal mother, she is taken in by a caring woman who teaches children in similar situations. When she is old enough, she is lucky enough to work in the household of a kind family. But as she grows more attractive and womanly, her luck begins to run out. She makes some very unfortunate choices, the first being to fall in love with the wrong person, which is where things start to go wrong. After this the reader is taken through the journey of Moll’s life, through marriages, (both happy and disastrous), adultery, prostitution and thievery. She is certainly a character that is enjoyable to read about. Defoe writes so convincingly, that it is hard to believe that these memoirs are not written by a woman. He has created a character who is cunning and scheming. She is manipulative and knows exactly how to use her beauty to the best of her advantage. However, she only longs for enough money to survive and live a quiet and honest life with a good husband. Unfortunately, life for Moll is not always fair, and as more and more misfortunes befall her, she becomes harder and more desperate. Looking back on her life, Moll is full of remorse, and regrets many of her actions. After reading about all Moll’s adventures, the reader is desperate to know how her life will finally turn out… Does she get a happy ending, or does her story end in tragedy in Newgate, where it all began? You’ll have to read it to find out. If you want to try it, click on the picture below.